The twin juggernauts of syndicated game shows, Jeopardy! and Wheel Of Fortune are among the longest-running programs on television. More than 20 million people a week tune in to watch each show, respectively. But true nerds know that one is awesome, and the other, well—isn’t. Nonetheless, the National Association Of Broadcasters has seen fit to induct both game shows into the Broadcasting Hall Of Fame, in a ceremony scheduled to take place in April of next year. Wheel Of Fortune has been on the air since 1975 (with Pat Sajak hosting since 1981), and Jeopardy! 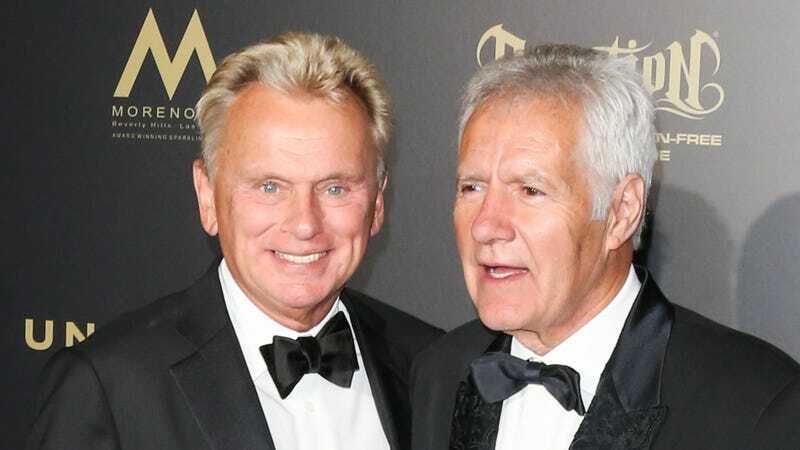 since 1984 (with Alex Trebek hosting since it began), both its hosts have received stars on the Hollywood Walk of Fame, and together they’ve produced more than 13,000 episodes of television. Nonetheless, none of the material in the press release about this induction mentions the fact that Jeopardy! is great, and Wheel Of Fortune is a milquetoast game of Hangman at best. Wheel Of Fortune has a couple hundred thousand more viewers per episode. Jeopardy! has won a Peabody Award for excellence. Vanna White is a Guinness World Records Holder for “Most Frequent Clapper.” Jeopardy! won the 2017 Emmy for Outstanding Game Show. Alex Trebek has been awarded the Lifetime Achievement Award from the National Academy of Television Arts and Sciences. Pat Sajak and White were often drunk while filming. And while that last one actually makes Sajak sound like more fun to hang out with, let’s not forget Trebek once ate a shitload of pot brownies. It also doesn’t change the fact that Wheel Of Fortune’s drama often depends on people spinning a wheel, while Jeopardy! is a raw assessment of trivia knowledge, a Thunderdome of excitement, interrupted only briefly so people can tell Trebek about the time they almost got lost in the Himalayas or whatever.